In January 2009 Diana Farrell joined U.S. President Obama’s administration as deputy director of the National Economic Council and deputy economic advisor to the President. 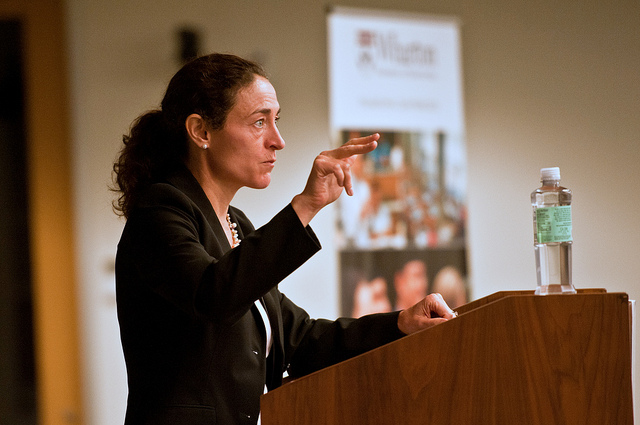 Prior to joining the NEC, Ms. Farrell served as director of the McKinsey Global Institute (MGI), McKinsey & Company’s economics research arm, since 2002. MGI’s independent investigations combine McKinsey’s microeconomic understanding of companies and industries with the rigor of leading macroeconomic thinking to derive perspectives and publish reports on important global economic issues. Under her leadership, MGI continued to build on its in-depth, sector-based productivity studies of economies around the world, but also spanned additional, related topics, including capital markets, global economic integration and foreign direct investment, the ascendance of China and India, labor markets and offshoring, the economic impact of demographic changes, health care, and global energy demand. Ms. Farrell’s work has appeared in academic journals, books, and on the op-ed pages of leading international publications. She is the editor of an anthology series based on MGI research, published by Harvard Business School Press, 2007. Together with Lowell Bryan, she is the co-author of Market Unbound, published by Wiley & Sons, 1996. Ms. Farrell was previously a McKinsey consultant in the Washington, D.C. office and a leader of McKinsey’s Global Financial Institutions and Global Strategy practices. She has served clients around the world in a variety of capacities. Prior to joining McKinsey, she worked for Goldman Sachs & Company in New York. Ms. Farrell is a member of the Council on Foreign Relations, the Bretton Woods Committee, and the Pacific Council on International Policy. Ms. Farrell has a B.A. from Wesleyan University in economics and in the College of Social Studies. She also holds an M.B.A. from Harvard Business School. Richard L 'Jake' Siewert White House Office, National Economic Council, The Goldman Sachs Group, Inc.
Gary D Cohn National Economic Council, The Goldman Sachs Group, Inc.
Rajat K Gupta McKinsey & Company, The Goldman Sachs Group, Inc.
Robert Zoellick White House Office, The Goldman Sachs Group, Inc.
William Wicker McKinsey & Company, The Goldman Sachs Group, Inc.